Create comfortable, convenient and fun learning opportunities for kids. This 46" square preschool learning tables teaches skills, promotes inclusion and fun—empowering children with the 20" table height. Constructed with commercial grade steel, this traditionally designed perforated table is strong, economical and has smooth rounded edges enhancing the comfort and safety. The MIG welded 1-5/8"O.D. frame is reinforced with a 1"O.D. support brace all coated in an impact, weather resistant UV stabilized, powder-coated finish. The convenient walk through bench design allows hassle free access when entering or exiting the table bench. This square steel perforated table features a standard 1-9/16"I.D. umbrella hole. 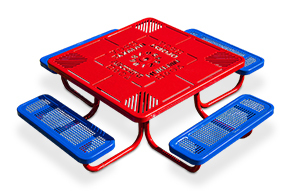 Models also available with standard perforated table top and seats.